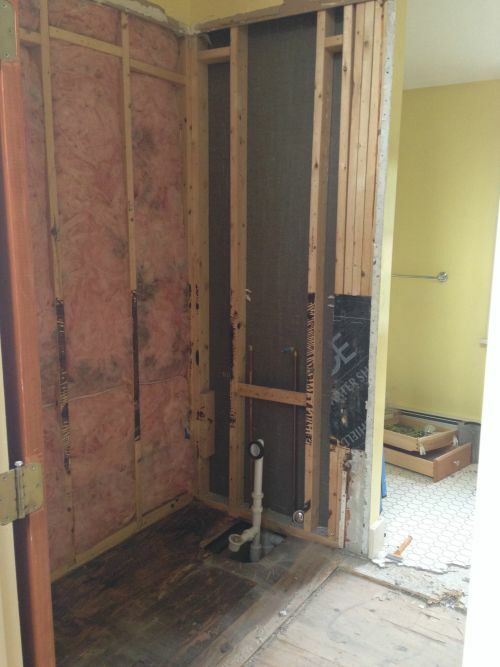 So we're remodeling our master bathroom. Sort of. 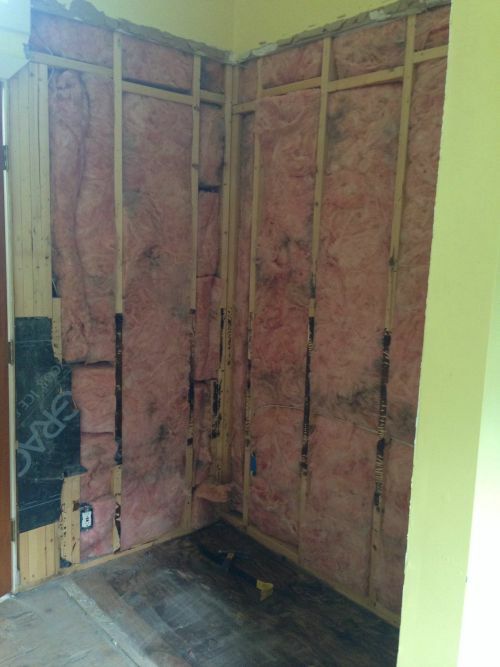 This was a completely unanticipated project spurred by a jacuzzi tub leak that led to demolition of our bathroom floors in order to get rid of moisture and mold. We always planned on painting and updating fixtures and replacing the "Nemo" accent tile (super cute for kiddos but no kiddos here yet), but that was really all. 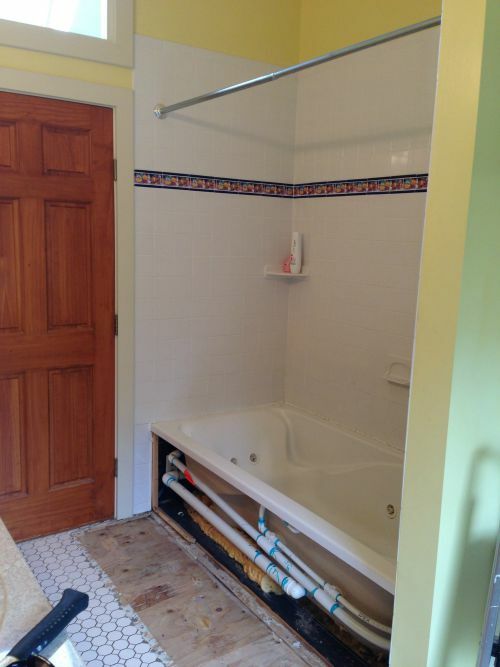 I'm not really a tub person, per se, but when we bought the house, the jacuzzi tub seemed more of an "oh that's nice to have" than a "what a money pit that is. Run!" Boy was I wrong. After two plumbers and dropping untold sums to fix a leak (THAT'S STILL NOT FIXED), not to mention the damage to our floors and downstairs ceilings I am singing a different tune. Damn that jacuzzi tub! I'm really bummed about those floors, though. While they're pretty much one of the cheapest tiles you can pick out at Lowe's, they're still pretty with their vintage vibe. Bye floors. 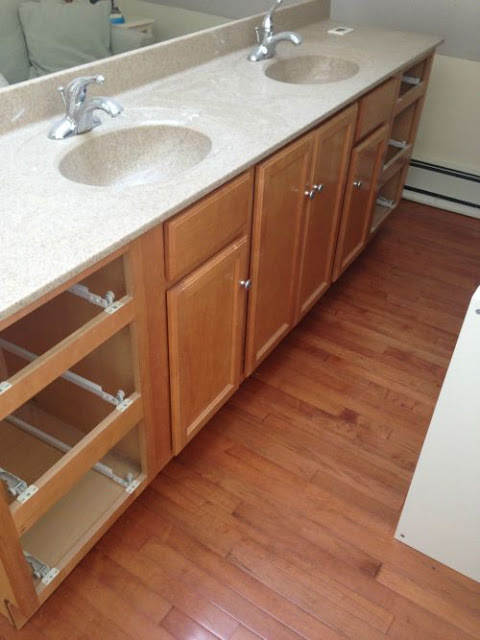 To save some money, we're keeping the existing vanity and countertop. Is it what I would pick? No. Is it completely functional? Yes. We're definitely going to paint it white and I'm thinking of replacing the drawer fronts and cabinet doors with something more shaker style. I'd like to update the faucets with something a little more "stylish" less "functional". Sometimes style over function wins. 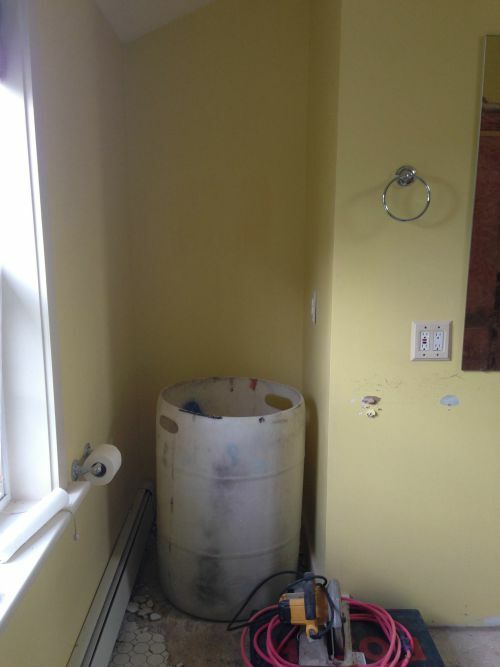 In other exciting news, we're getting a new commode and we'll be updating the lighting, mirror, and other fixtures. Here's what we picked out for tile. 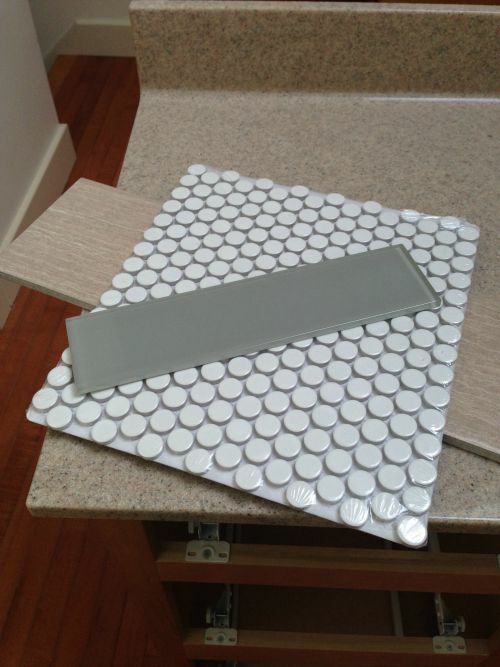 We're going with the 3x12 glass subway tile in "smoke" for the shower walls. "Smoke" looks more green than gray in person and I think it really compliments the existing countertops. 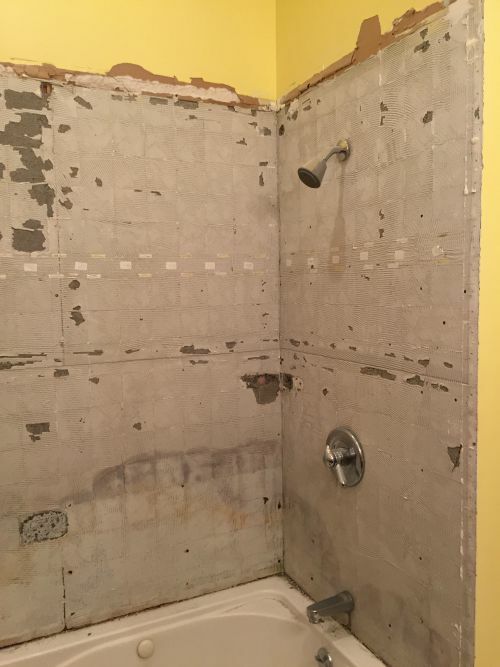 The shower floor and shampoo cubbies will be tiled in white polished penny tile and we're using a 6" x 24" porcelain tile laid in an offset pattern on the bathroom floors. 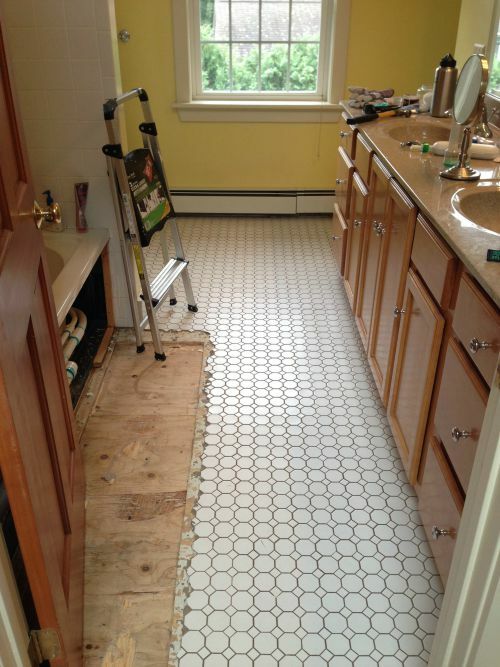 To be honest this wouldn't be the tile that I'd select if I was doing a bathroom 100% from scratch, but sometimes you have to work with what you have and this is the perfect exercise in doing so. Can you feel the beachy, zen vibe we're going for? After 1.5 days of demo, things are looking pretty bare bones. PS: I don't post nearly as often as I'd like (damn real job! ), but I do post on Instagram at least a few times a week. You can follow me at JessHouse2Home for more frequent updates! 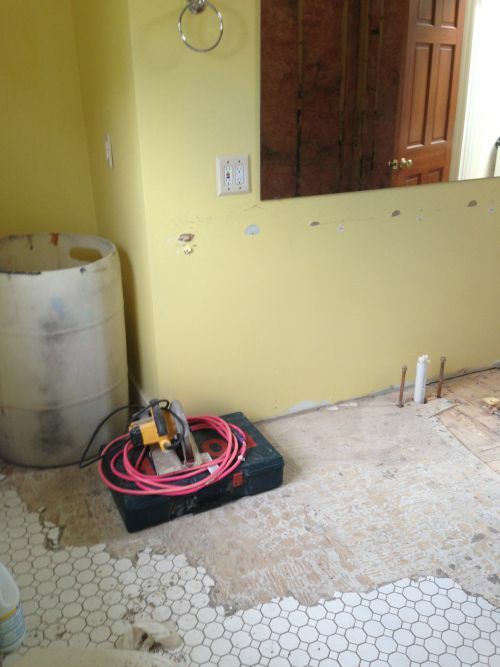 UPDATE: My awesome husband (who spent most of Sunday on a ladder demoing tile from the walls instead of on the couch watching Sunday Football) requested I add a picture of his hard work. From his iPhone to this blog post, here you go honey! Hard work much appreciated. I love reading all of your blog posts and love your style and design!!!! I copied your guys' coffee table for my house from one of your blog posts :) I am hoping to plan a trip out there next summer and hope to see it all in person!